Free woodworking plans for a deep coat closet. Includes ample shoe storage and a bench seat. 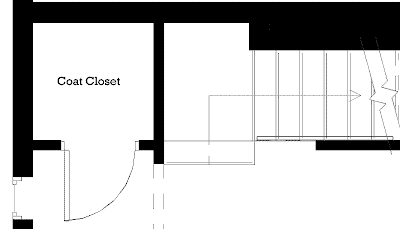 I was getting ready to order the lumber for my coat closet organizer but I started having second thoughts about my http://littlebitjohnny.blogspot.com /2013/01/step-in-closet-organizer-plans.html" target="_blank">previous design. 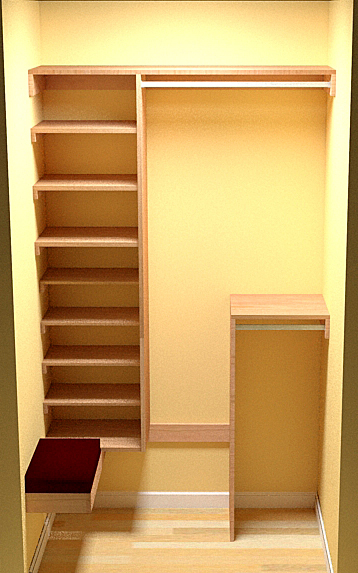 The previous design provided a lot of storage for this multi-functional closet but it had some drawbacks. Even though there is plenty of room to store shoes on the shelves I have a feeling they won't be used. There is no place to sit and take your shoes off in very close proximity to the closet which means it's going to be easier to kick of your shoes and just leave them on the floor. My coat closet is located in front of my stairs which makes it deeper than a typical reach-in closet which makes it a little difficult to plan an efficient layout. I decided to use some of that extra depth to include a bench in the coat closet. 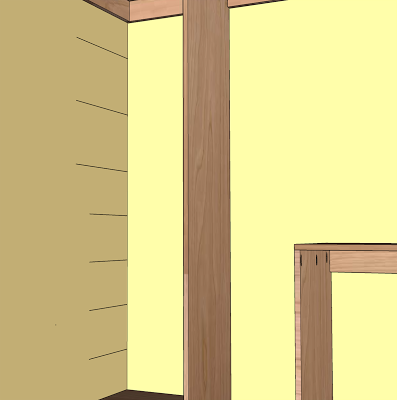 It will turn the front coat closet into a small mudroom type closet. It won't be like the other closet to mudroom conversions that are open, this closet will still have a door that can close but still provide the necessary functionality. 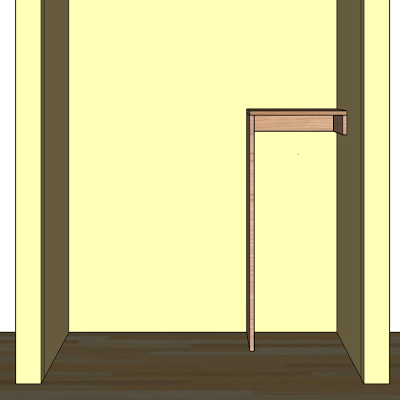 The current amount of hanging space is sufficient so the new design will have about the same amount of hanging space for coats with both double hang and single hang poles for larger coats. 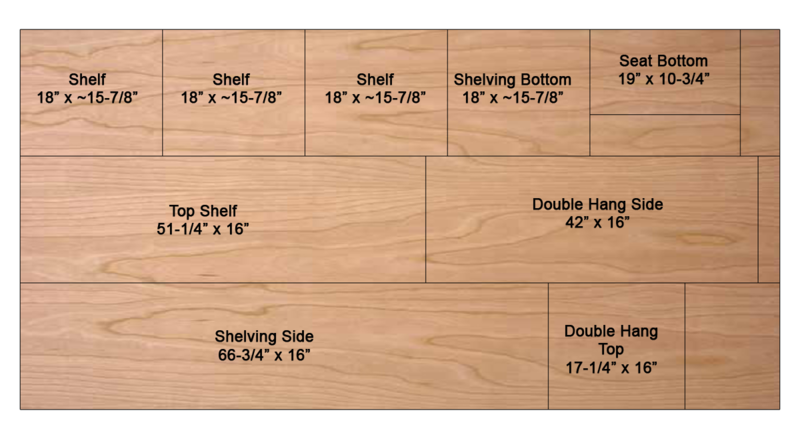 Shoe storage will be greatly increased by adding 5 18"shoe shelves which should be able to hold 2 pairs of men's shoes or 3 pairs of women's shoes each. 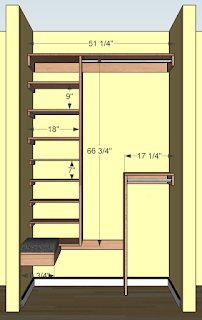 Additionally, taller shoe storage is provided under the bench and shelves for boots and other items. 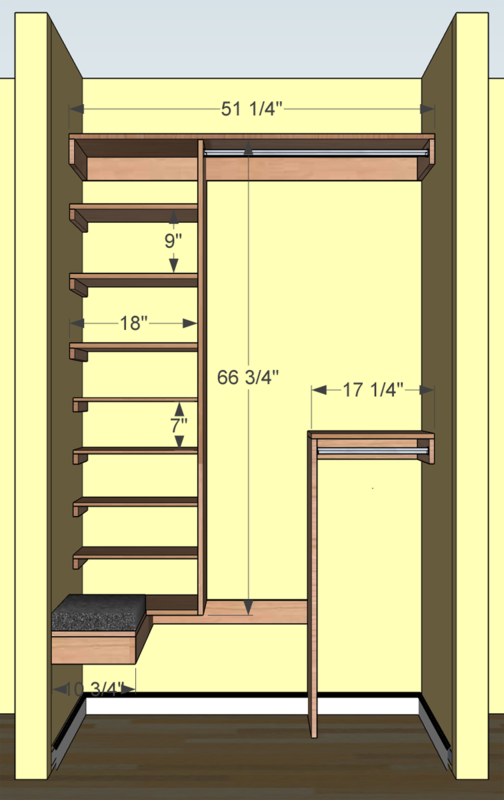 The shoe shelves are only 12" deep (instead of the full 16" depth of the shelving unit) to provide a little extra elbow room when seated. 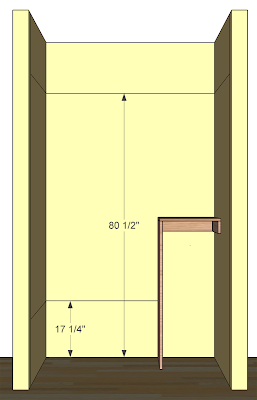 The 2 12" shelves that were installed above the closet rod will be replaced with the 16" deep top shelf, which runs along the entire back wall, and 3 18x16" shelves. This will provide enough storage for the miscellaneous items that wind up in the coat closet because they can't seem to fit in other places. The deeper top shelf will make it easier to store some of the large Rubbermaid totes that are a little too deep for the current closet shelf. I would have liked to make the shelves adjustable but that would have meant buying a second full sheet of plywood and losing about 3/4" of space for either shelving or hanging which would have been a problem for me. An upright vacuum cleaner can be stored in the long hanging section or possibly in the corner in front of the double hang section. The most important change however is the inclusion of a small padded bench. 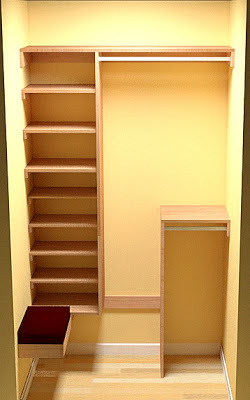 It's a little narrow but big enough to provide a space to sit and take off or put on your shoes. My plan is to use maple for all the lumber. The full sheet of plywood will likely be pre-finished 3/4" maple PureBond. 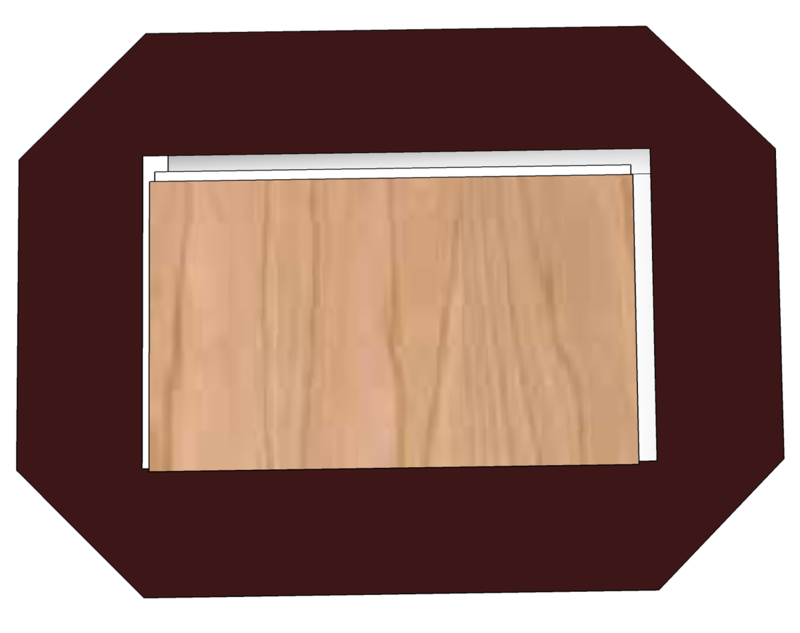 The main component will be cut out of 3/4" Plywood. 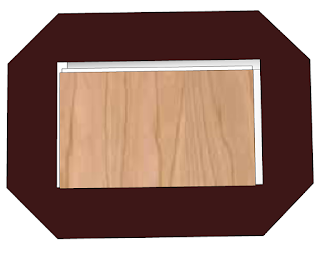 You can save a lot of time if you purchase pre-finished plywood. 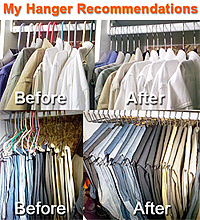 You'll need to make appropriate changes for your particular closet dimensions. 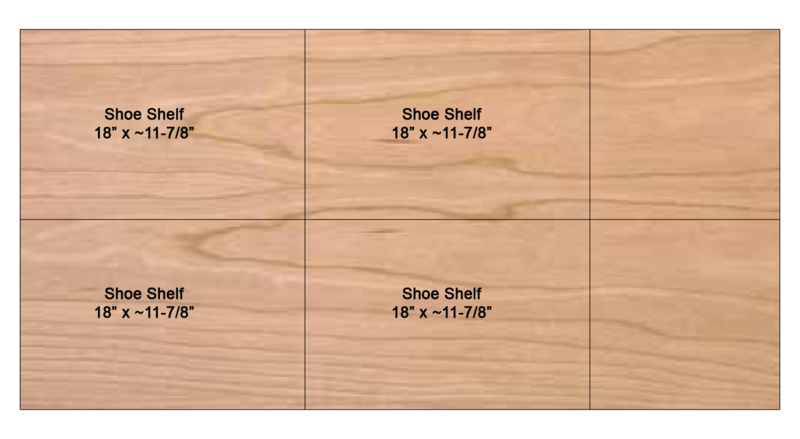 Two rip cuts will be made to produce two strips 16" wide and what ever is left over will be used for the shelves. The actual dimension will be 16" - (2 * saw kerf). The shoe shelves don't need to be very strong. 1/2" plywood will be sufficient given the span and weight they will hold. 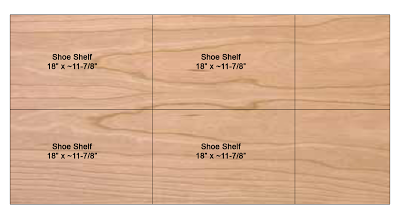 So to save money and space I'm using 1/2" plywood for the shoe shelves. Cut in center of 2'x4' sheet to make 2 equal sized pieces accounting for saw kerf. The 1x4 boards will be used for the main supports to hold the closet organizer. The can be prefinished whole and then when cut to size the ends sanded and finished in place where exposed. 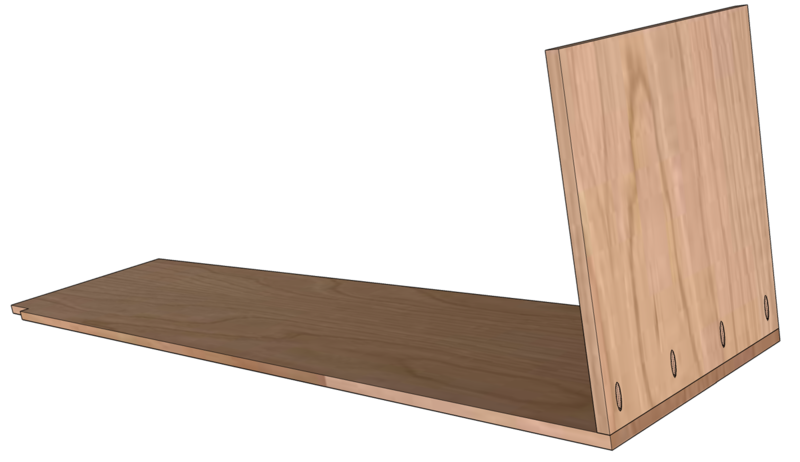 1x2 is used to support the wall end of the shoe shelves. 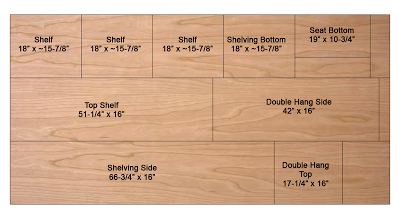 Double check the closet dimensions and cut all plywood to size and apply. Apply 3-4 coats of Polycrylic and edgeband where necessary. Some of the boards I'll cut to length and finish with 3-4 coats of Polycrylic. Avoid using oil based finishes because they can out gas for many months and make your clothes smell. Before cutting the boards to length I'll double check the stud locations and make any of the short boards that don't extend the whole wall longer than necessary so that I can attach them into at least 2 studs. 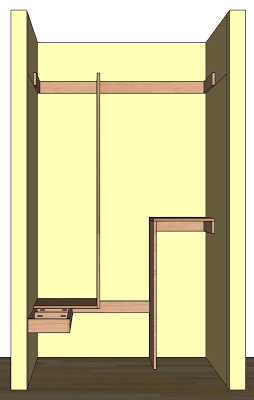 The lower section of the double hang can be assembled beforehand and installed in the closet as one unit. Start by attaching the top, wall and back using pocket hole screws as shown below. The illustration shows the components upside down and backwards for ease of assembly. Place the double hang cabinet in the desired location making sure it's plumb and level. Attach it to the wall by driving 3 to 3-1/2" wood screws through the back and side components into wall studs. Determine the high point in the floor if any using a level. From the high point, mark 2 distances on the back wall at 17-1/4" and 80-1/2" up from the floor and draw level lines at the marks. The bottom line indicates where the top of the bottom supports will be located. 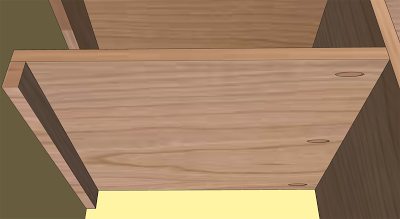 The top line indicates where the bottom of the top supports will go. Since we want the top of the top support to be at 84" and we're using 1x4's as supports, we subtract 3-1/2" from 84". That way the top of the support will be where we want it but we can see the bottom of the line without having to stand on a latter when installing the top support. Starting with the short pieces, attach the 1x4 supports to the walls by drilling 3 to 3-1/2" wood screws through the face of the 1x4. Use 2 screws to secure to each stud for maximum strength. Do not use drywall screws. Attach the front and center components of the bench frame using pocket holes as shown. The center supports should be no more than 12" apart. Cut a notch at the top of the side panel to fit around the 1x4 top shelf support (3/4" x 3-1/2") and drill 2 pocket holes that will be used to attach the side to the top shelf support. Attach the bottom of the shelving unit to the side using pocket screws as shown. Place the shelving unit so it rests on top of the lower supports. Make sure the side support is plumb then attach it with 2 screws through the previously drilled pocket holes into the top support. Drill pilot holes and counter sinks and use 1" to 1-1/4" flat head wood screws to attach the bottom to the bottom support and bench frame. 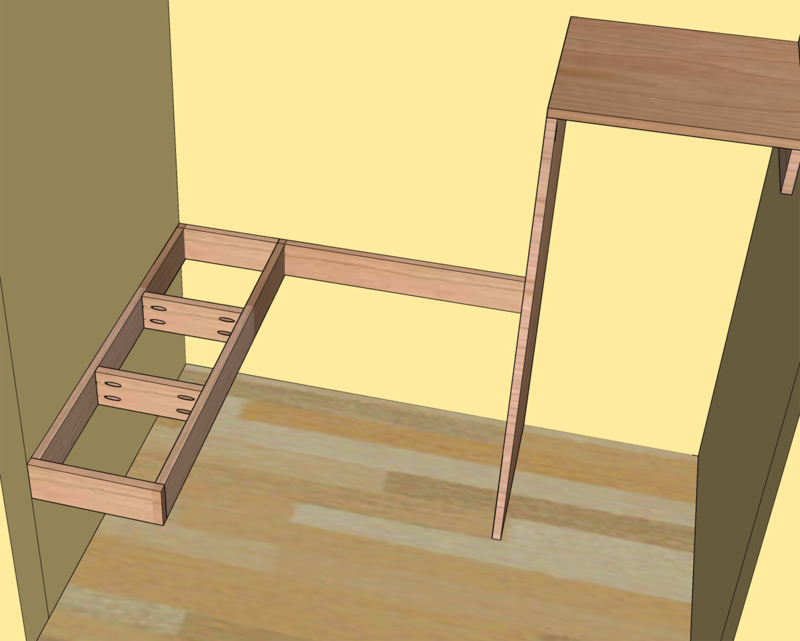 Start by placing the top shelf on top of the top supports and shelving side. Drill pilot holes and countersinks from the top about every 12" or so using 1 to 1-1/4" wood screws. Next mark level lines on the side wall where you'd like to install your shelves. You can customize the placing how best suits you. 7" spacing is good for most shoes, including high tops and high heels, but you can do more or less depending on your shoe storage needs. 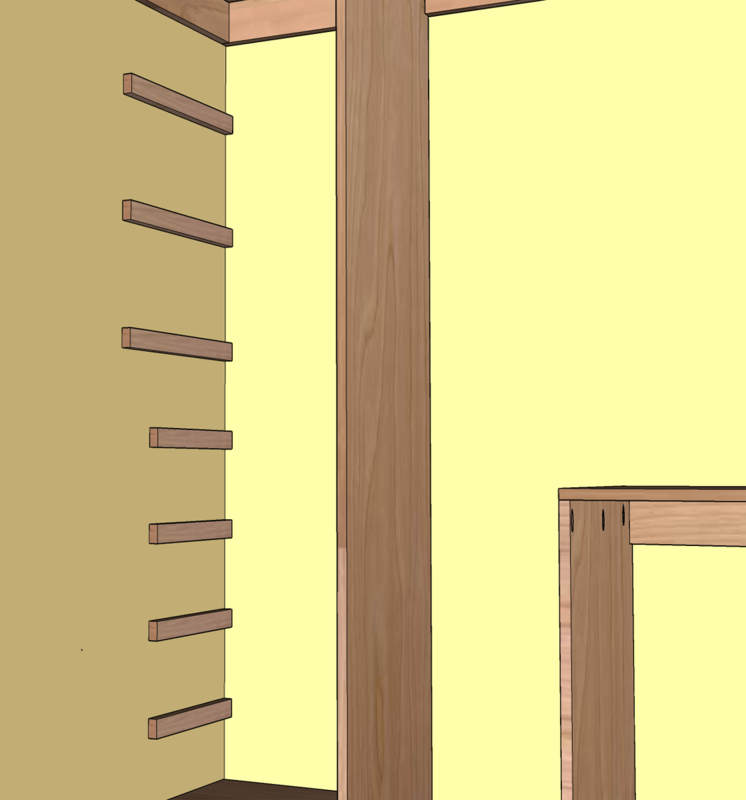 Now install the 1x2 shelf supports on the side wall by screwing them into studs using 3 to 3-1/2" wood screws. Make sure each support is drilled into 2 studs and that they are level back to front. You may need the supports to be longer than the shelves to accomplish this in some situations. The lines you drew previously represent where the tops of the supports should go. Finally place the shelves in place and secure them by predrilling and countersinking from the top for the side supports and using pocket holes into the side panel as shown. Next we'll need to mount the flanges for the oval closet rod. Two holes need to be drilled for the 5mm pins on the back of the flange. 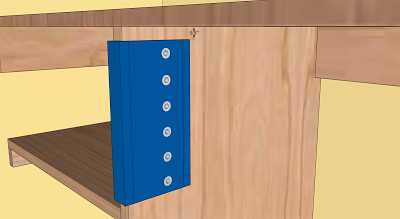 The pins are 32mm apart on center and we need to install the flange so the top-center of the closet rod is about 1.5" down from the shelf above it and 14" away from the back wall. For a normal closet it would be 12" but for a coat closet the extra 2" accounts for coats which tend to be larger. 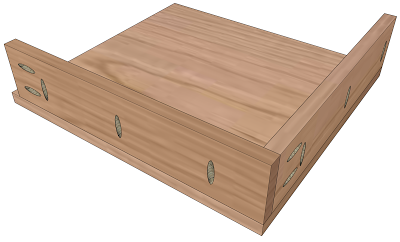 To accomplish this we need to drill the first hole 2" from the front of the organizer and 1 1/4" down from the top. If you have a Kreg Shelf Pin Drilling Jig and a Kreg 5mm Shelf Pin Jig Drill Bit this is very easy to do, Simple position the jig against the front of the panel using the long side and move the jig down 5/8" from the top and drill a hole in the top 2 holes of the jig. You can create a 5/8" spacer to use at all 4 locations. Place the flanges in the holes and secure with a 1/2" screw. Cut the closet rod to length and place it in the flanges. The seat cushion is optional but in addition to making the the seat more comfortable it also elevates the seat to a more comfortable height and it discourages people from using the seat as another storage shelf. 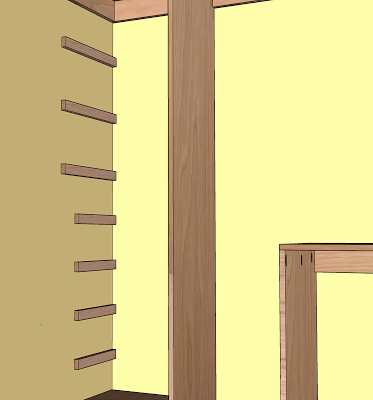 The 3/4" plywood bottom of the seat will need to be a little shorter than the width between the wall and the shelving unit to account for the thickness of the fabric covering. Start by cutting the foam to size. Cutting it about 1/2" wider so it overhangs the front a little will look nicer and be more comfortable. Cut a piece of batting large enough so it overhangs the foam by 1" along the front and sides of the cushion. Use spray adhesive to keep it in place on top of the foam. Cut the cushion fabric a few inches longer than the batting so that there is enough material to wrap around the foam and plywood. Trim the corners for less bunching at the corners. Layer the components of the cushion upside down starting with the fabric (good face down), batting and foam (batting down) and finally the plywood bottom. Wrap the fabric neatly around the cushion and staple it to the bottom of the plywood. Attach the cushion to the frame with pocket holes up from the inside of the seat frame. You have finished reading Coat Closet Revisited and many articles about Tech Gallery in our blog this, please read it. and url link of this article is https://littlebitjohnny.blogspot.com/2013/01/coat-closet-revisited.html Hopefully discussion articles on provide more knowledge about the world of new tech gadgets.